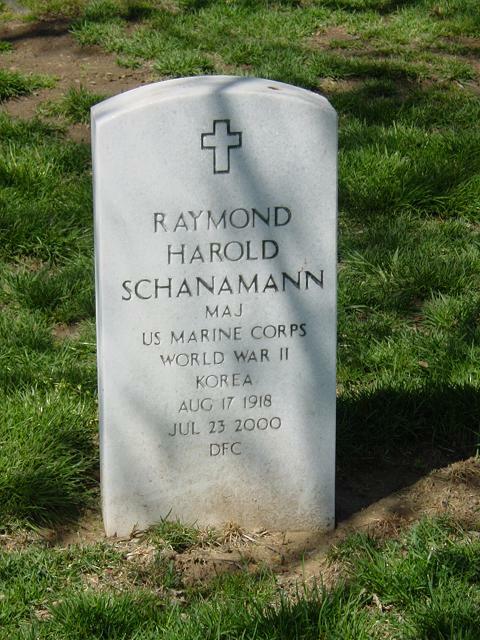 Raymond Harold Schanamann, 81, a retired Marine Corps Major who was a Navy Department program analyst from the late 1960s to 1980, died of peritonitis July 23, 2000, at Inova Alexandria Hospital. He lived in Falls Church. Major Schanamann was born in Philadelphia, where he graduated from Saint Joseph's College in 1950. He served in the Pacific in the Marine Corps during World War II, where he flew F4U Corsairs and received the Distinguished Flying Cross and the Air Medal (4 awards). He was in the Marine Corps Reserve in the late 1940s and was recalled to active duty during the conflict in Korea, where he was a company commander. His last assignment, before retiring from active duty in 1964, was at Quantico, where his duties included managing the secret-and-compartmented department involving classified messages. In the mid-1960s, he taught at Thomas Jefferson High School and did military consulting work at what was Melpar, both in Annandale. He was a member of Blessed Sacrament Catholic Church in Alexandria. Survivors include his wife of 52 years, Elizebeth Dorothy Schanamann of Falls Church; two sons, Steve, of Gaithersburg, and Ray Jr., of Reston; a daughter, Helene Safford of Alexandria; a sister; and nine grandchildren. A son, Robert, died in 1979. On Sunday, July 23, 2000, of peritonitis. Marine officer, fighter pilot, beloved husband of Dorothy Schanamann; father of Stephen, Raymond Jr. and Helene; and grandfather of nine grandchildren. Requiem Mass will be offered at the Ft. Myer Old Post Chapel at 8:30 a.m. on Wednesday, August 2, 2000. Interment will be in Arlington National Cemetery.